"You must stay drunk on writing so reality cannot destroy you." ~ Ray Bradbury. I tend to agree with Mr. Bradbury, although my writings steer clear from dystopia, I am a fan of Batman and the young Bruce Wayne … throughout this blog (if you stay long enough) you’ll come to understand what this mortal thinks of the world around her … maybe you'll even agree. Everyone gets tired. Tired because they’ve physically worked hard, tired because they are mentally exhausted, tired because sometimes everyone feels like the entire world is against them. 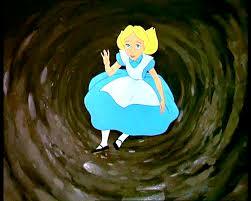 And it isn’t any fun when you fall down that rabbit hole and try as you might — scratch, cry, plea — you can’t find a way out. Can’t leap out, can’t crawl out, can’t scream for help to have someone else lift you out. But. Even on those dark days when you walk around with a sign on your back that says “Kick Me”, even then there is always light at the end of the rabbit hole (or the top, as it might be). Because there is always tomorrow and so long as the breath remains, there is always hope — always. Which is exactly why, no matter my past disappointments, no matter how many times I’ve been tired and started to descend that rabbit hole, I am always reminded that it’s those struggles, those moments of “disaster” that have made me who I am and for that, I will always be thankful and never once will you hear me say, “I wish I would’ve …” because had I, then I wouldn’t be me. And I kinda like being me. Next Do these pants make me look fat? Very inspiring! I love the Gandhi quote, too. Yes. And isn’t that a lovely thought? Would you believe the Caesar salad originated in Mexico?